Introduced in 1987, the Sierra RS500 Cosworth was the definitive manifestation of the high-performance RS Cosworth, developed by Ford Motorsport in the mid 1980s to make the marque competitive in Group A racing. Homologation regulations called for only 500 vehicles (hence the “RS500” moniker) but despite their small numbers, “evolution models” were conspicuous on the roads thanks to subtle differences from their more common Cosworth cousins. These included a lower rear spoiler, a “gurney lip” on the upper “whale tail”, and a redesigned front section. Underneath, meanwhile, a larger Garrett turbocharger pushed output up to 224 bhp, meaning the RS500 could travel from 0 to 60 mph in 6.1 seconds and to a flat-out speed of 154 mph. On the track, although it lacked the handling capabilities of the BMW M3, its significant power advantage (it could call on over 500 bhp in full racing trim) meant that it went on to dominate touring car racing. On the road, 500 lucky drivers got to live out their automotive fantasies at the wheel of an eighties icon. Please share your reviews, videos, pictures, or critiques about the RS500 in the comment section. And be sure to check back regularly to read our very own Simraceway staff give you some insight into the creation of this high-performance machine. A video I made back in January, this was for a long time (maybe still) my favourite car in the game. I noticed it has been updated recently but I've yet to give it a try. 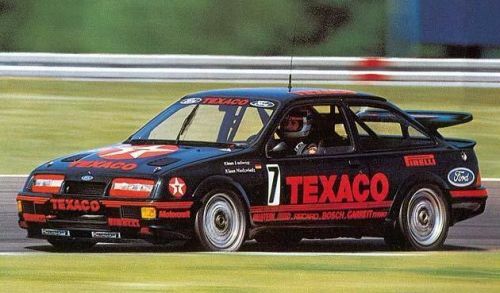 I had a toy car of the Sierra Cosworth with that exact livery when I was a child! I saw one Sierra yesterday, looks awesome and fast if you see it in real life. I can see lot of ford sierra rs500's on the street. I must say that in game Sierra is an awesome car . What a sound !!! And it handles perfect . One of the best cars in SRW ! Worth of every cent ! The more I’m driving this car, the less I understand why it doesn’t have a cult following in SRW. I mean ok, it’s slow. But boy, is it a smile-machine. Group A, BTCC or DTM. And man, if they were all like that, I’m very sad I missed this era of racing. Gotta find me a VHS player. To turn this vanilla family car into a track monster, Ford did the obvious thing and rang Cosworth. The tuning company delivered a boosted four-cylinder that was designed to accept very high pressures. They also added a massive and now-iconic “whale wing”, that was found to be pretty useful when reaching speeds up to 300kph in race trim. Ford only needed to sell 5,000 unit of the car to pass homologation, so that’s what they did. But in 1987 they felt the need to produce an evolution of the car, to make it truly unbeatable. Tuning company Tickford (later Prodrive and Ford Performance Vehicles) upgraded pretty much every aspect of the engine, to improve power and durability. Only 500 of these very special cars were made, and it’s the one we get in SRW: the RS500. This car was a true surprise to me, and especially its engine. I never expected a boosted four-pot to be more enjoyable than some V12s, but it truly is! It sounds so spectacular, with massive blow-off noises and cracks and bang when you lift off. Glorious! It makes good power too, for a car this age and type. And it really feels like a race engine, with a somewhat peaky power delivery up high in the rev range. Ah, those were the days, when nobody cared about turbo lag or smooth torque figures. Just cram as much power as you reliably can, and make all the noises that would make 5-year-old me so happy! This car just makes me smile on the inside. And it’s not only the engine, either: the whole chassis is really suited to some track usage. It has a strong front-end, and a rear-end that just wants to exit sideways, no matter what. The original British hooligan! Though it was made to ferociously compete on track in some of the most fierce racing categories in the world, it seems it never forgets its humble origins. And the result is a car that while being competent around a technical track such as Sonoma, never takes itself too seriously. It’s also a very good car to polish your RWD car control skills, because the way it loses grip is so very smooth and predictable. And isn’t it what we want, ultimately? Some cheap, loud and smoky fun. The fact that it looks so quintessentially eighties only adds to the appeal. So come on guys. It’s less than a dollar! Let’s all get one and race to no end around Edmonton! I can’t picture too many ways to have more fun, right now.